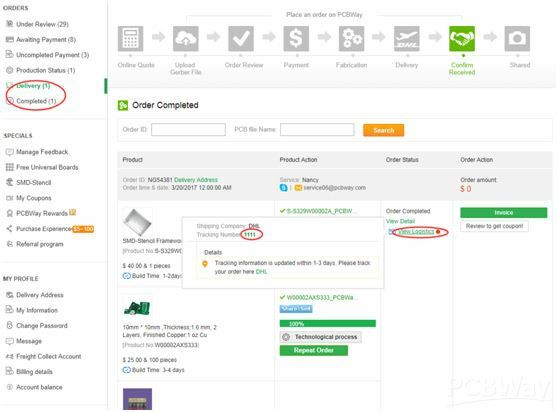 Go to “My Account” or “My PCBWay”> Delivery or Completed > View Logistics and click the Tracking Number. If you find the tracking number is invalid, it may be because the shipping company needs 3 to 7 days to update the shipping status. You can also contact your service/sales representative for more shipping information. You may leave a message for email or click Contact your service/sales representative on order list page. kind tips:What if courier company (DHL etc.,) fails to deliver my PCBs as scheduled? This does happen from time to time, though pretty rare. If this happens, please contact courier company for updated time of delivery. Though legally we are not responsible for the delay, we still will track or phone call courier company for updates. The worst case is that we will remake PCBs for you and re-ship to you. For the extra courier charges, we may talk to courier company for compensation. Method 2: If you didn’t receive your order, please contact your service/sales representative or leave feedback (our Case Management Team will check). Method 3. you can always apply for a refund by opening a dispute. Click here to open a dispute. Method 4. If you did not receive your order, please click the Chat with us button (at the bottom of this page) to chat with our Customer Service Team.